Humble, kind, genuine, down to earth, defines this young boy from a rural background, who has a list of achievements, that is never ending. We have tried to cover a few. Read on! Let me take this opportunity to introduce this boy from a small village, who once, did not know to even communicate well in English, but today, he is invited to inspire the youth through his speeches. 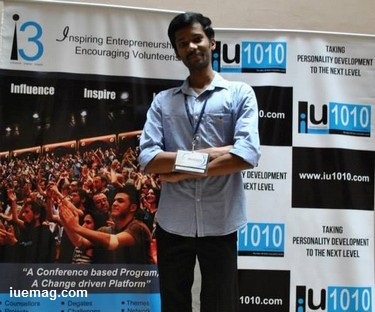 Mr. Bharath Kumar is a technology-geek who aspires to create a history, not just in the field of technology, but also, as an inspirational speaker and as a responsible citizen of his country. Bharath Kumar was brought up in a small village named, Chalkere, India, where he pursued his education from 1st grade. He was a boy, with not much interest in what others did, never bothered about rules and regulations of the school too. He was stubborn in doing what he wanted to do. He grew up in the same way, but, was always that curious kid who wanted to learn more. This way he continued to study well in his school days and secured 88 percent in his 10th grade, which is a dream for a lot of students even in cities. He recalls, “Somehow, I managed to score 88% in SSLC, but, my attendance was less than 50%, because, I have participated in, not less than 60 competitions during my high school days. I travelled across the state, but, only for competitions. I also represented Karnataka in National Level Camp for Solar Eclipse, Bhopal during my 9th grade and I was one among the only three students who represented our state. I was also a Kho-Kho player and an athlete. I was once chosen for an ‘on-spot science model designing’ competition. I was totally worried since I was responsible to get a good name for my school. I had a few books which taught to make science models. I opened it and tried to design one simple model and learned more. In the competition, I was the only person to design more than 14 models within an hour and from then, 3 consecutive years, I got 1st place in cluster, Taluk levels and also represented the district many times. These are some of my childhood experiences I remember”. He chose science as his main course of study for his 11th and 12th grade, where Physics, Chemistry, Mathematics and Computer Science were the main subjects he had to focus on. Computer science became one of his favourite subjects and he secure 99 marks in the subject during his board exams of 12th grade, where he happened to score an overall percent of 86. With a lot of dreams, he travelled down to the garden city, Bangalore, and got his admissions to take up engineering at AMC College of Engineering. “I never knew what I would learn in Bangalore, because, it was a new place, new stream, new people, new culture, new college, new friends and a new hostel as well. 1st semester passed like a year, 2nd - like a month and 3rd - like a week. I soon realized it will seem like days and minutes. I never did anything apart from my academics, until I found a platform to explore myself. I was extremely poor in communication and was not good in expressing thoughts. The journey at the platform of i3 was astounding - The phase of my life where Sundays meant a lot and an incredible journey of 14 weeks that changed my life. I got connected to a lot of achievers, got marvelous mentors, lot of knowledge” he says. At i3, he started communicating with all his mate-delegates in English and they encouraged him to do so. After 4 weeks of his journey at i3, he was nominated as the ‘delegate of the week’ for having executed a social project creating massive impact. That was the first time, when he got a stage to speak, where he gave an inspiring speech about his experience, in English! Huge applauds from the crowd encourage him to become a better speaker. He reached to various government schools and orphanages, inspiring children and the youth. Because of his drastic improvement and massive impact, he was tagged as a True IUITE of i3 season 1, Bangalore, a title given to the best performer(s) of the season. He continued to execute various projects, and at the same time, his learning from the counsellors at i3, made him enhance his technology skills too. He happened to clear the Microsoft Technical Association examination, where, only five out of a thousand students, get to pass in the examinations and Bharath was one among them. He was also invited to various colleges to inspire the students and help them realise the importance of practical learning. He became the pride of his college and his college has included his profile in the presentation that includes the list of achievers who have passed out of the institute, but, the only profile of the student who is still pursuing his studies in the institution, is Bharath’s. He is now working on various technologies, interning at Pluwis Web Solutions. He continues to inspire people through his words and action. Who said people from rural areas cannot achieve? They are those, who have more potential to achieve, and if given the right direction, nothing can stop them from unlimited achievements!